ISLAMABAD: (April 5, 2019): President of Pakistan Dr. Arif Alvi has emphasized the need to accelerate efforts to adopt new technologies in every field of life. He was addressing the closing ceremony of HEC-Huawei ICT Skill Competition 2018-19 held here at HEC Secretariat on Friday. The ceremony marked the announcement of winners who will compete in the Global Final to be held in China next month. Congratulating the Higher Education Commission and Huawei for successfully conducting this ICT competition for students, he said that there is a huge potential of exports and employment generation in Pakistan’s IT and Telecom industry, adding that this actually holds the key for any country’s development. Such competitions will prepare our younger generation to effectively contribute for country’s socio-economic development. Huawei ICT Competition Pakistan 2018-19 was launched in September last year. Roadshow and workshops were held in 53 universities and academic institutions across Pakistan. More than 5000 students attended the examination conducted on Huawei’s learning platform. Top 300 students were invited to attend the second round, of which 171 students passed HCNA Certification. The top 100 students took part in the National Final and the most competitive top six students were selected for the Middle East International Final in China. In May 2019, the top three students Zohaib Anwar, Jawaria Abbas and Asim Fareed shall participate in the Huawei ICT Competition Global Final in China with other regional winners from all over the globe. Speaking to the audience, the President stressed on the need to realize the swiftly increasing scope of information age, and implementation of right strategies to bring in relevant technologies in different fields. He gave various examples of education, health and agriculture sectors, and underscored the fact that a proactive approach is required to identify and incorporate IT solutions in every single field. Dr. Alvi also highlighted the role of the State to ensure that younger generation is provided with every opportunity to unleash their talent and play an active part in this age of rapid transition and application of technologies. He narrated how he has been endeavoring to bring in IT solutions for his political activities not only in his constituency but also bring reforms in the election processes at party as well as national levels. He talked about the gaps in our university education and demand of different markets. Though in some areas, we see very relevant output of graduates but overall we have to make more concerted effort to ensure that a person graduating from a higher learning institution has the relevant and updated skills and knowledge. Relevant research is inevitable, if Pakistan has to progress and stand tall in the comity of nations. The President mentioned how China has emerged as a global leader, particularly in development and adoption of latest technologies. He also acknowledged the tremendous achievements of Huawei in a short span of time. Mr. Shafqat Mehmood, Federal Minister for Education and Professional Training congratulated the students who have won at national level and wished them luck for participation in the Global Final. He advised the students to be firm and committed in their efforts. As our Prime Minister always says that if you don’t accept defeat, nobody can defeat you. The Minister informed the audience that the Government is focusing the areas where technology can help us leapfrog. Efforts are afoot to link the skill development of our youth to the country’s future requirements, and to ensure that an environment is created where ideas can flourish. I appreciate HEC for taking a number of initiatives for this purpose. And I further assure that the Government’s full support is for innovation and technology. 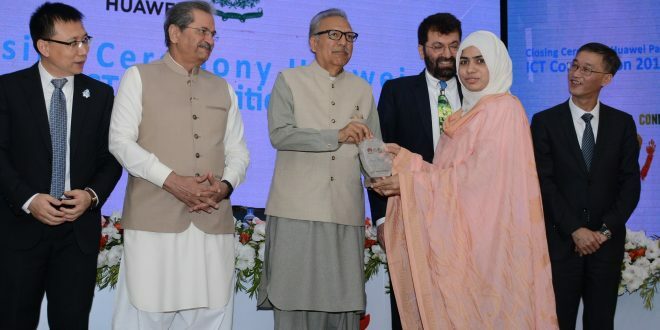 Dr. Tariq Banuri, Chairman HEC thanked the President for taking out time for the event, and for his continuous support to the cause of education. Giving two examples from news stories that appeared on Friday morning, one about selection of five Pakistanis in Forbes’ 30 under 30 and the second about a man’s attempt to build a small aircraft in Pakpattan, Dr. Banuri highlighted Pakistan’s potential to grow and take the upcoming technological challenges head-on. The only thing we need to step up is unleash this imagination and creativity of our people, particularly youth. The Chairman emphasized that “technology is an input in the development process, the real source is imagination. And I am pleased to say that HEC is trying to create an environment where our youth is enabled to do so.” He particularly mentioned Pakistan Education and Research Network (PERN) which connects universities and research institutes at national as well as global levels enabling them to keep pace with the world. Describing HEC-Huawei partnership, Dr. Banuri said this collaboration has helped Pakistan in development of ICT setup. He said Huawei has taken different ICT initiatives jointly with HEC. In his remarks, the Chinese Ambassador Mr. Yao Jing said the global economy depends upon development of ICT, which is a pivotal element for nation’s progress. He admired the students who have won the competition and wished them good luck in the final competition in China. He said Pakistan and China enjoy cordial relations and the two countries are committed to working together to cope with future challenges. Mr. Saif Chi, CEO Huawei Pakistan that we will continue to see the digital and physical world merge as emerging technologies become a greater part of our lives. “In order to welcome the arrival of the intelligent world, Huawei has always focused on R&D. In Pakistan, Huawei established office in 1998. Since then it has been playing vital role in making Pakistan go digital”, he said. Previous Do you have a phobia?